This Counter Culture All Purpose Organic Cleaner in Lemongrass is a safe, easy-to-use, probiotic cleaning tonic that helps to control the microbiological environment in your home with its 13 strains of live, good bacteria. The use of regular, and especially antibacterial, cleaners around the home kills both types of bacteria. This leaves behind a layer of biofilm, which acts as a food source for the next batch of harmful germs. 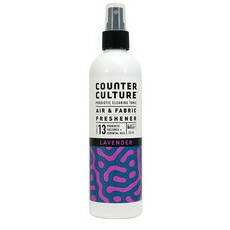 When Counter Culture is sprayed onto surfaces, the probiotic cultures destroy this biofilm, eliminating it as a source of food and thereby keeping bad bacteria, and any associated odours, to a minimum. Your home is left clean, fresh, and with the refreshing scent of blended Lemongrass, Lemon Myrtle, Pink Grapefruit and Rosemary essential oils. Safe and non-toxic, it is ideal for use in the kitchen, for spills in the fridge, for children's toys and for marks on furniture. It also effectively cleans stainless steel, giving it a streak-free shine. 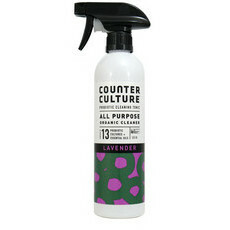 The all-natural ingredients in Counter Culture combine to effectively break down oil, fat, and grease, and leave surfaces fresh and clean. Counter Culture All Purpose Organic Cleaner in Lemongrass can be used on any substrate, including granite, wood, tiles and bamboo, and is safe to use around children and pets. Made in Australia. Vegan. Not tested on animals. Septic tank friendly. Spray onto surface and wipe off. For dirtier surfaces, leave for up to 15 minutes before wiping. 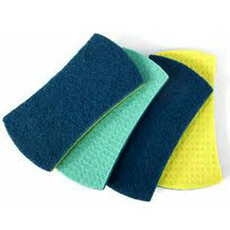 Can be used on any substrate, including wood, granite, bamboo and tiles.